Google’s suggestion feature is an interesting look into the internet hive mind. I recently noticed that the top suggestion for a search starting with “what” is “what is twitter”. Interesting, no? I thought this might have been because of my previous searches (what you search about says a lot about you! ), so I logged out and saw the same thing. Not convinced this was enough, I logged onto Google through Tor and another browser with cleared cookies. Same difference, Twitter really is getting this much curiosity from the public. Visiting Google Trends sheds some more light on who’s looking to find out about Twitter. The search query peaked in popularity around on April 17th which coincides with the Asthon Kutcher / CNN follower race. Richardson, TX (an affluent suburb of Dasllas) takes the prize for the city most interested in figuring out what Twitter is. If you want to add me on twitter, I’m @jonknee. UPDATE: I did more Google Suggestions analysis with some interesting results. Essentially we’re doomed–the most popular searches are for things no one needs to search for. My first instinct was to say that Google tailored it to you regional area (geo-IP), but you were able to duplicate that numerous times. Twitter is being hugely talked about in pop-culture — just tune into the E! Network for more than five minutes, and many brands are present and are engaging with consumers on social media. 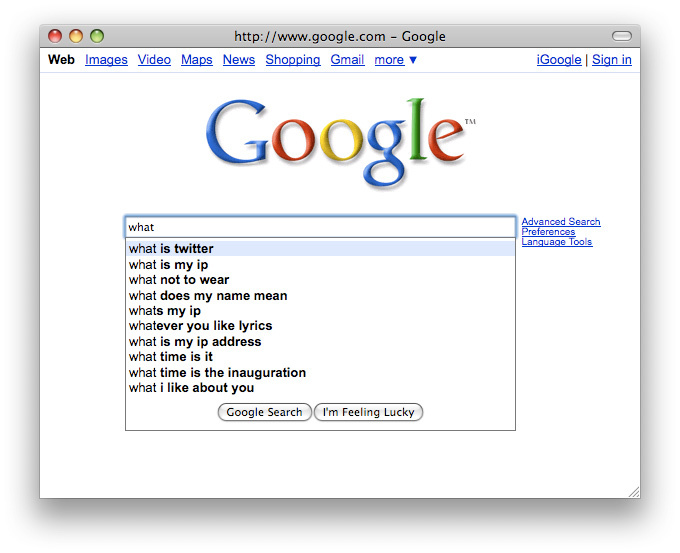 Given that, I would suspect that “What is Twitter?” is invoked by people into Google. I too sometimes have fun with Google Suggestions… seriously, Google exposes how poorly people search the Web. The first suggestion for “I am” is utterly baffling. Wow, you aren’t kidding. To future proof this–the top suggestion for “I am” is at the moment “I am extremely terrified of chinese people”. It looks like this may have been caused by an article of the same title on a satire website… I think a lot of people missed the satire. Funny. I’d actually never read the source article before – just other sites wondering what this result meant, or what it implied about google users. Shaaaarp thing to look for. I’ve seen so many humorous Google suggests lately, but this feels poignant.